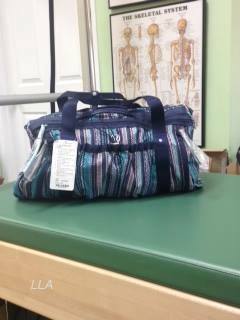 The new duffel bag we saw in the Summer Sneak Peek video is available at Strategic Partner stores. 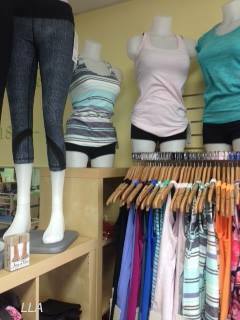 There is also a new Aquamarine Groovy Stripe Cool Racerback out. hello lovely northern hemisphere lulu addicts, from down under a wee heads up on some of the stuff that you'd mentioned in your blog earlier this week. We did get some great stuff uploaded here. Most exciting being the rulu items!!! so soft, so yummy to wear! I ended up getting the Run pacesetter half zip in heathered deep coal. A timeless colour in a very durable fabric. Key being it can be worn all year round here. Just love it. The Base runner pants were a complete suprise. I think I'll be picking up a pair tomorrow. Rulu soft, look great rolled up to a 3/4 length and so slimming its like magic. 3 great colours, the black/soot are slightly ahead of the inkwell. Loved the idea of the run turn around vest until I put it on and had nowhere to put my hands!!! No pockets???!!!! What the??!! Its specifically a run vest but still. It has a wee half moon shaped backpocket but thats it. Would have got it in a heartbeat otherwise. Getting all my ultra violet out for another round since its back again and in the same shade of swiftly. Love it when that happens. Aquamarine is very pretty. It's a good thing I don't really care for stripes (except n a wafs pattern), so I don't want this CRB or the dune version. Funny they brought back groovy stripe. I recall these going to wmtm and a lot in my stores on markdown. Although I have to admit that dune and aquamarine are much nicer versions. And if they are soft (as LLA mentioned), that's great. I like the bag pattern. I hope it comes in a tote! Got my wamo camo crops in the mail today. I love them! I tend to favor dark pants (black, blue or gray). For reference, I am a size 10 and they do not make my thighs look big. I fully expected to be returning them but they are a keeper! @ diva - I am hoping they make a Go Lightly in that pattern. @ anon 6:43 am - I know. I think of Groovy Stripe as being more street wear rather than gym wear. It's too preppy or something to me. @ anon 2:08 am - the Base Runner pants were one of my favorite items from last fall. They were pricey but I think worth the splurge since you can use them alone or as a layer on top of run crops. They're as cozy as sweatpants but not as casual looking. what does strategic partner stores mean? I think I need that duffel. Love the new print. Went to one of my local stores. Saw the Flow to Om bag & am so glad I ordered it online. It's buttery soft, big & will be great to use for work. Finally saw the Wamo Camo print in CRB. The colors are much nicer than in photos. I'm not a fan of camo or I'd have gotten it. I got a Karma LS in Heathered Plum on markdown for $49. So soft & I love the length. Have the same question as Anonymous... what does strategic partner store mean? Love that bag and would love to get one!